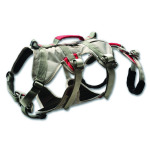 The Ruffwear dog harnesses are among the best in the UK. Ruffwear range of dog harnesses are a great alternative to a collar and lead and each allow for a number of outdoor activities. From bikejoring to hiking, Ruffwear dog harnesses are easily attached to human harnesses - as well as dog leashes and allow you to take control of your dog easily and readily.